In this game you control an apprentice wizard who must survive a horde of zombies for as long as he can. To help with that, the Great Wizard left his old hat with his apprentice and anything can come out from it! 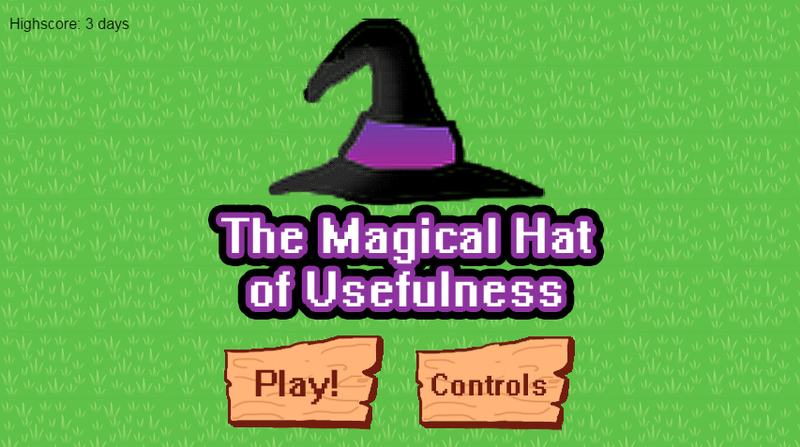 The Magical Hat of Usefulness is the first "Jam" game I made alone. Despite the simple graphics, I really enjoyed working on it and playing it. I was able to create all the mechanics I wanted and make them work! The theme for this Ludum Dare was: An unconventional weapon. With this idea I could create several unconventional weapons and different mechanics for each one of them. The enemies ended up being zombies and the win condition for them were touching the player or reaching the top of the screen. During the development I was using "Waves" as an indicator and counter of the zombie hordes. Everytime a wave is finished, the next zombies would have their speed increased. When I was testing a few weapons, however, I noticed a much more fun way to play (in my view). Instead of making them faster, I would just let them continue spawning. By increasing speed, at a certain point it would be impossible to win and I did not want that. Since there are a lot of different weapons, just by letting the "non-killed zombies" remain on the screen, and continuously spawning new ones, I would be creating a challenge for the player. Because of that I changed the name "Waves" for "Days", since the concept of wave as not being used. Besides that almost nothing changed since the pre-concept of the game. I think this is a good thing.